UFO videographer Gabriela Decall managed to tape "variable geometry" objects over the city of Cordoba on April 29th of this year. 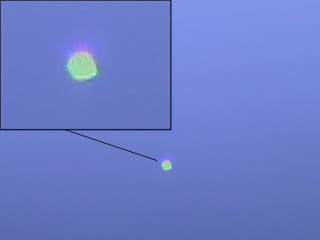 Since activity over the Cordoba area is recurrent, and Gabriela Decall has fortunately managed to capture some excellent images on video, these videocaps correspond to a very particular UFO that can be seen on the last part of the video, wher the object moves through the sky "as though it were swimming". A total of nine (9) objects went by on April 29, 2009. They went past within the typical time frame of 15:00 to 17:00 hours. Their trajectories were varied -- north to southwest, east to west -- and one came from the east, remained stationary for 10 minutes, before returning east again.